Step indoors to the lush environment of the glass-enclosed Aquatic House, where it's warm, moist, and often sunny even in the dead of winter. Tropical and subtropical plants cascade from hanging pots and tree trunks, grow skyward from beneath the water, or float on the surface of the pools. Carnivorous plants, mangrove trees, and giant Victoria lily pads in the bog environment of the southernmost pool. Colorful orchids blooming throughout the house. Most are epiphytic species—plants that use other plants for support and get moisture and nutrients from the air. Some hang from wooden pots or racks. Others are growing on tree trunks as they would in their native habitat. More orchids in the display cases. There are hundreds of orchids in the Garden’s collection, and the most spectacular are placed on view here when they bloom. The Aquatic House is particularly inviting on a cold day, but orchids bloom here throughout the year. Be sure to visit in other seasons to see more of the collection. The Steinhardt Conservatory’s three indoor pavilions are climate controlled to replicate different ecosystems: an arid desert, a humid tropical rainforest, and the mild warmth of the Mediterranean, California, and South Africa. The colorful tubular flower spikes of aloes blooming in the Desert Pavilion. South African bulbs like Natal lily, Cape cowslip, and bird-of-paradise blooming in January and February in the Warm Temperate Pavilion. The fragrant olive blossoms also smell wonderful at this time of year—you may notice the lovely scent before you can identify its source. 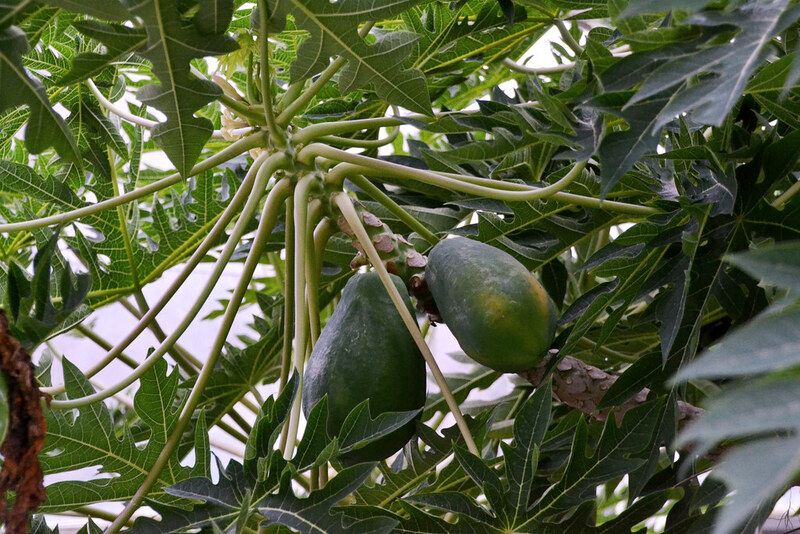 Mangoes, papayas, starfruit, jack fruit, guavas, and other tropical fruits and flowers growing high up in the branches of the Tropical Pavilion's trees. Plants from different regions that share the same growing conditions grow together here: African honeysuckle and Italian jasmine in the Warm Temperate Pavilion, Mexican cacti and succulents from Madagascar in the Desert Pavilion, and South American anthuriums and fishtail palms from Asia in the Tropical Pavilion. Conifers and winter-blooming witch-hazels in the Rock Garden. Fascinating buds that may have fuzzy scales or emerge in colorful clusters, as well as tree bark that peels or twists or seems to almost glow like fire. Winter-blooming hellebores inside the Flatbush Avenue entrance, in the Discovery Garden, and along Magnolia Plaza. 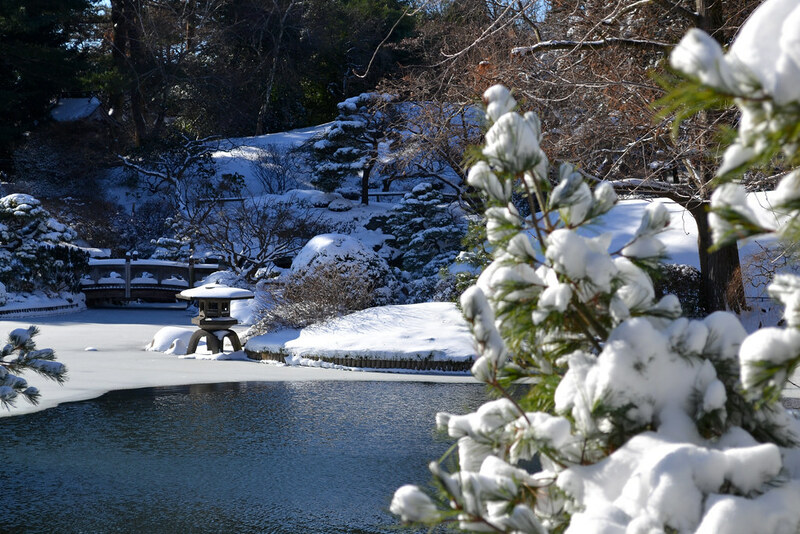 Japanese Hill-and-Pond Garden. Photo by Dana Miller. 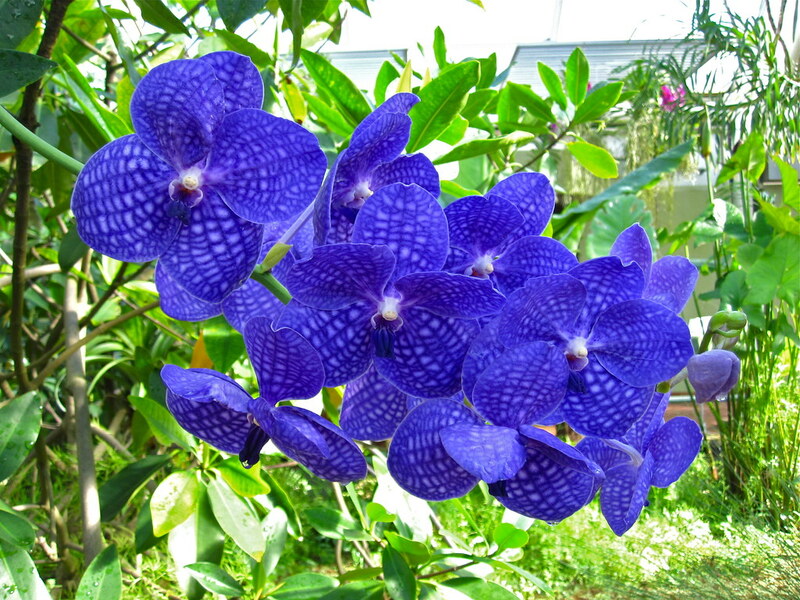 Vanda Bangkok Blue blooms in the Aquatic House. Photo by Rebecca Bullene. Carica papaya (papaya) fruiting in the Tropical Pavilion. Photo by Lee Patrick. 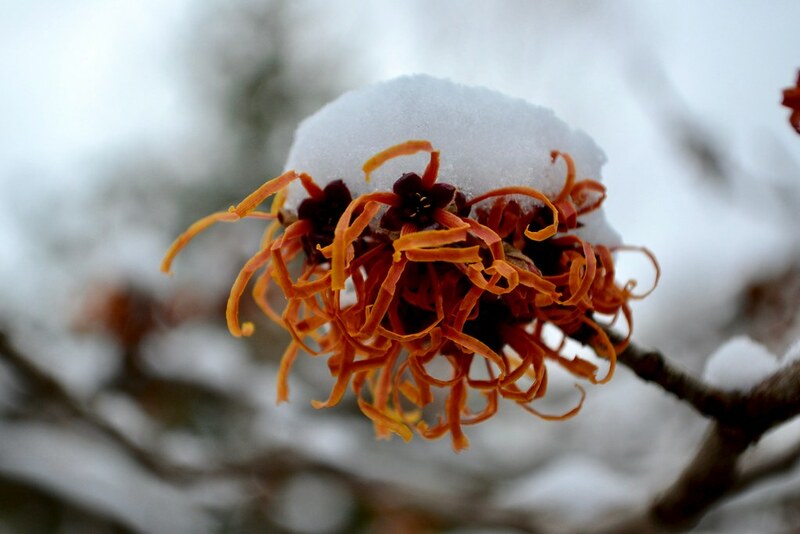 Hamamelis x inermedia 'Jelena' (witch-hazel) in the Rock Garden. Photo by Blanca Begert.